This article will walk you through the demo I ran at PAX this weekend. 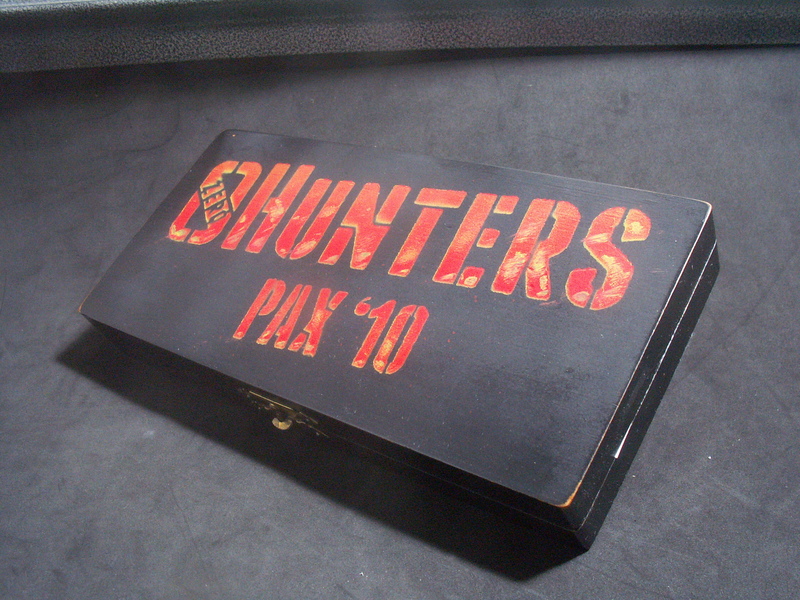 It should give a clear impression of how 0 Hunters works. Well a bit clearer then my silly theory articles have anyway. Check out this attractive box! While I never put much thought into a box when pitching to publishers, presentation counts with the public. 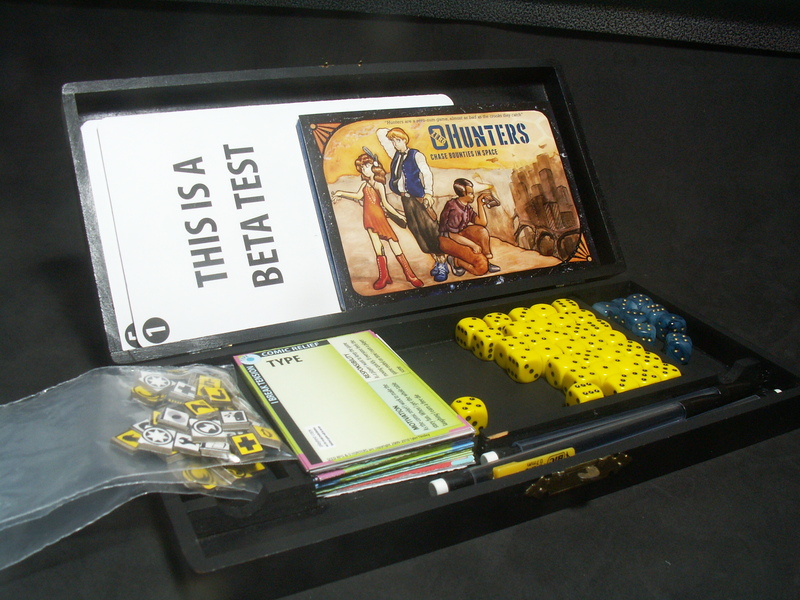 I also wanted the box to double as a sign for the table I would demo at. 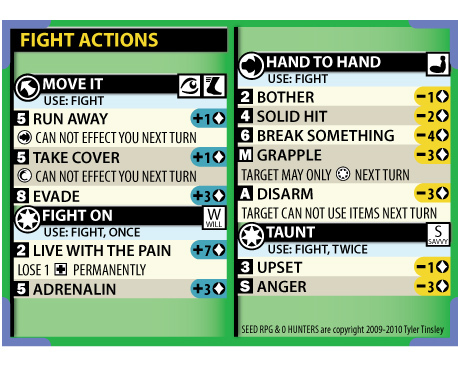 These rules cards were a last minuet addition to the demo kit and boy were they worth the effort. The cards are not the full rules but rather quick outlines to reinforce learning at the table. I will use them to teach you the game with this in blog demo! 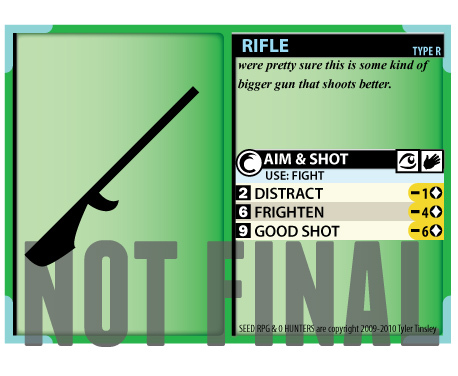 The first card was the beta test disclaimer. This made sure people at the table knew this game was incomplete and to expect a few bugs. I tend to dress up my prototypes a little too much, they look too finished for where I am in the development process. This is because when I intend to self publish, I like to test presentation at the same time as rules. I throwaway a lot of work with this process but I think a refined finished product is worth it. This card describes the first stage of character creation. 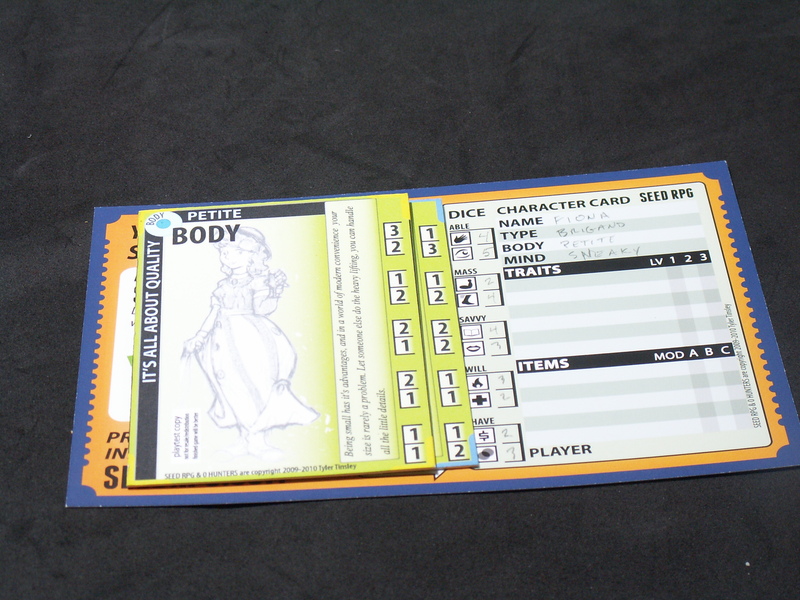 Players pick a Body card (lets say “Big”) and a mind card (maybe “caring”) these two cards combine to give the character a unique stat line. 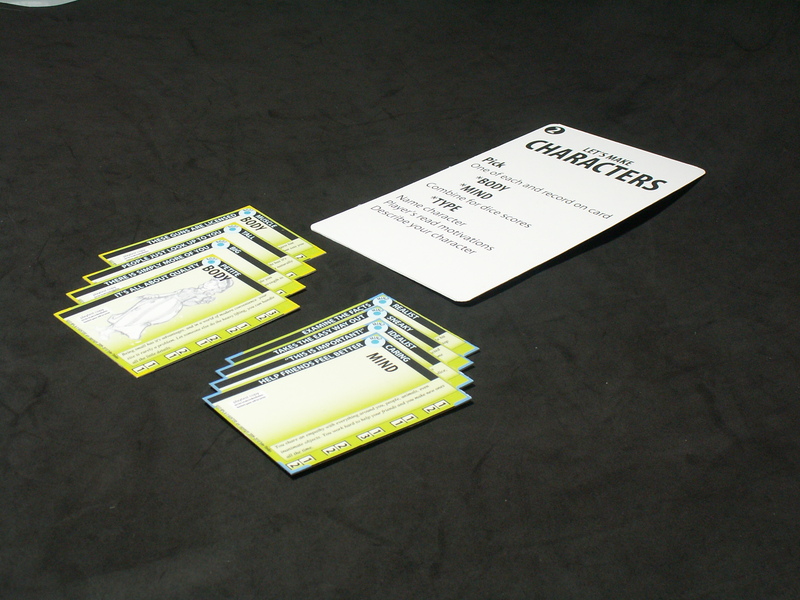 These cards function to give players a quick way to visualize their character’s looks and personality. Body & mind condense stat generation into two easy choices. A popular method for stat generation is “point buy” for new player’s investing 10-100 points into abilities and skills with a usual RPG is an abstract experience if they are not sure about how each stat relates to play. By tying sets of stats to descriptors like “Big” “tall” “fit” “petite” or “sneaky” “idealist” “realist” “caring” the choices and results are no longer abstract but easy to understand, but there are still plenty of potential characters. This gives me as a designer massive control and insight over what numerical resources players are likely to have. While I will not know the precise distributions of stats among individual characters I will know the totals of each stat across the whole party. Meeting your motivation gives player’s an opportunity to reward you with special “free dice” these can help you with future dice rolls. Motivations provide an incentive and inspiration for each player in the group to narrate their actions. This is a true narrative challenge judged by the other players at the table. At this point players have made 3 choices, body, mind, and type. An example character could be a “big, caring, hero”, or a “petite, sneaky, comic relief”, its neat how just a few words can start to inspire a character in your mind. It’s it’s at this point when players are asked to name their characters and describe them to the group. 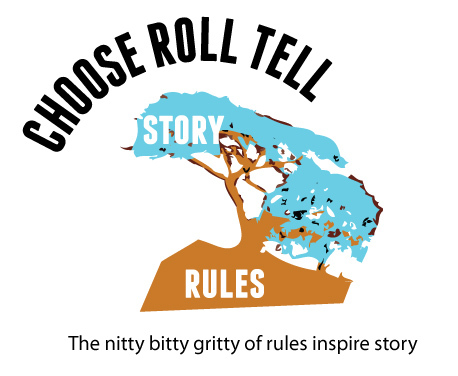 PICK, ROLL, TELL, is the basic process for playing the game. card three spells this process out in big bold letters, this helps players understand what is expected of them. It also drives home when they will be expected to meet their motivations. 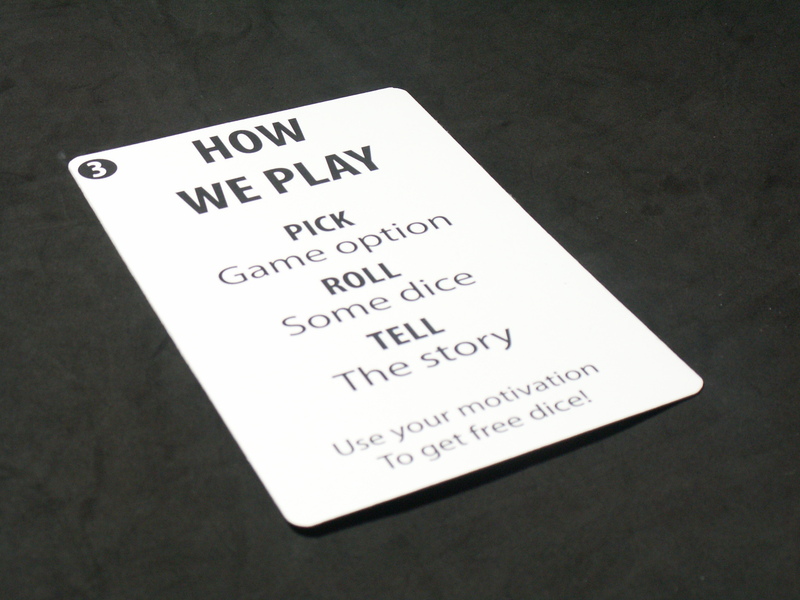 Card four outlines the process of playing a short opening scene or “hook”. This scene is about the players fighting over who gets to eat the last steak in the fridge. 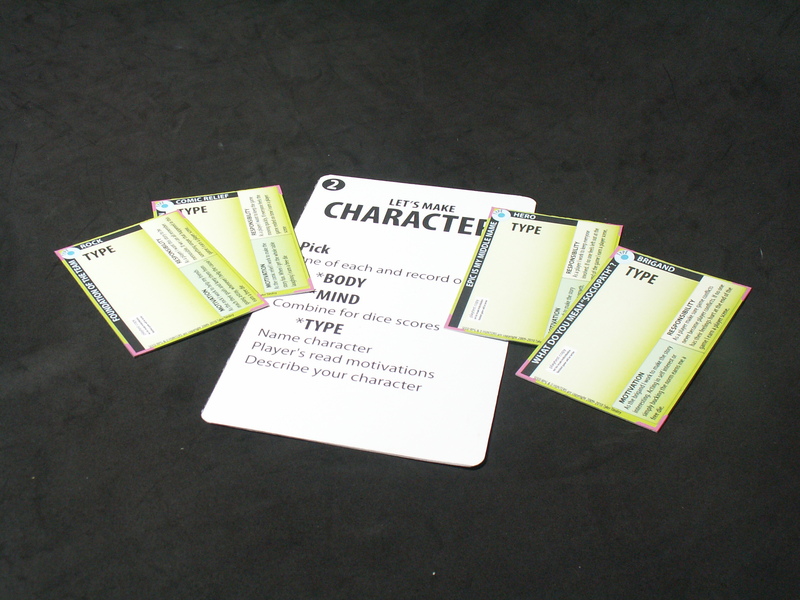 It walks players through an example of the PICK, ROLL, TELL sequence to help reinforce the points learned on the last card. The scene it’s self is played like this. Players and the gm (playing as a stowaway creature aboard the ship) pick a listed action by throwing rock paper scissors, this does not end the challenge it provides extra dice if your action counters another player’s. After claiming extra dice players roll the stat listed with their action choice. 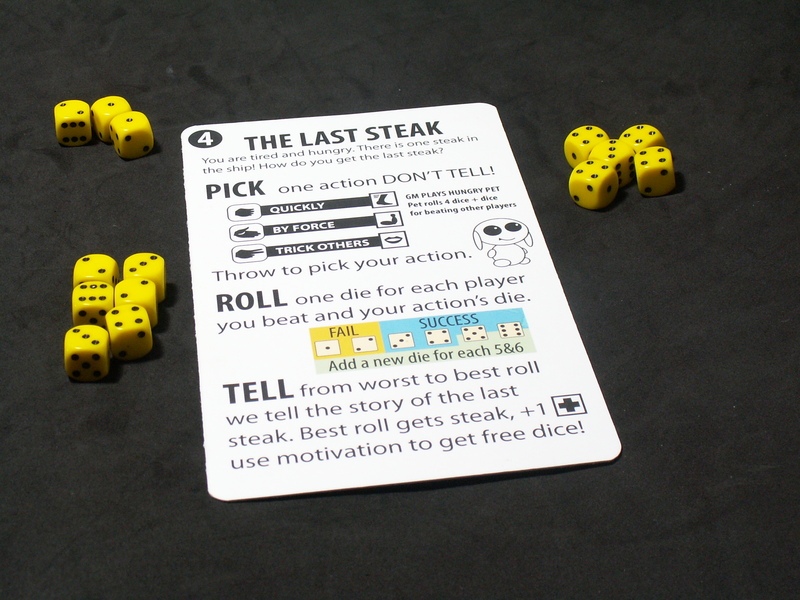 Once all players are finished rolling the player with the lowest roll starts the scene by describing how their character tries to get the last steak. They are interrupted by the next highest roll who then tells about how they try to get the steak, this repeats until the highest roll actually eats the steak. When player’s start narration, the outcome of the game has already been determined. What is unknown is if players will be able to meet their character motivation. The predetermined outcome gives players free rein to tell the story the way they want to without worrying about gm approval or understanding what specific rules to use. The character motivation provides a focus and reward for this unique narrative challenge. motivations are quite literally a player’s motivation for story telling. It’s as this point that the short demo ends (usually about 15 min). I briefly describe the elements of the game not shown in the demo, like the unique plot card and how it drives play, the extended scenes called challenges, the character traits and item cards. 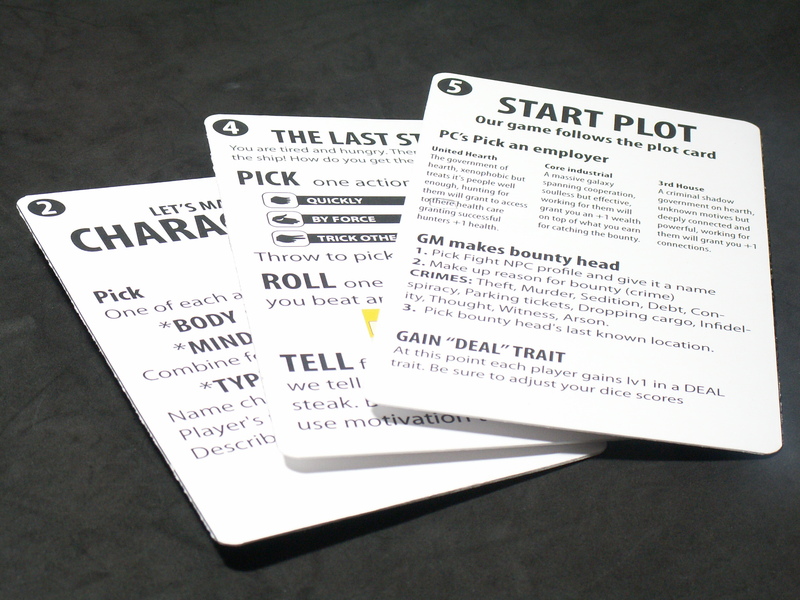 If the player’s have more time or wanted to play more at this point I would walk them through cards five and six that go over how an actual plot is played. I will cover these cards at a later point. Start this blog to talk about what I’m doing with 0 hunters & seed RPG. 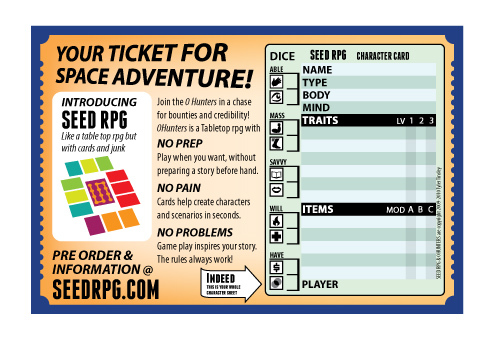 I am going to Pax to playtest the game and hand out this postcard to promote Seedrpg.com. Near the end of September I will start a pre-order on kickstarter.com that will last for two months. By the end of these two months I will have produced over 40 pieces of artwork and be near to completing the game. If the kick starter works I will make a production run of the game, if the kick starter fails I will use print on demand services to build up interest until I feel a production run is worth the risk. 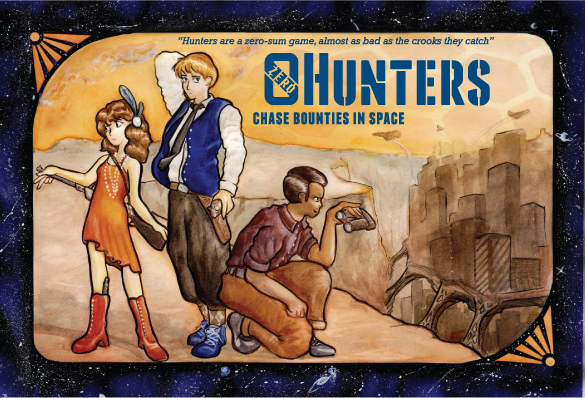 Regardless by April of next year I will have finished copies of 0 hunters ready for sale at Sakura Con and will make it to as many anime and game conventions as I possibly can.